What Will You Say When You Win Your Next Award? Perhaps before we dive into how best to accept an award, maybe we should discuss just exactly what the thinking behind giving an award is. 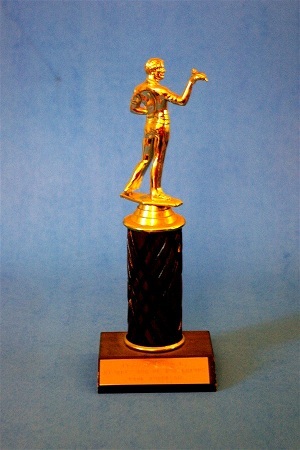 Awards are generally given by an organization (think Academy Award, Tony Award, Nobel Peace Prize, etc.) to an individual in recognition of an accomplishment or service to the organization. What this means is that a whole bunch of people have decided that you are the best person to receive this award. When you are accepting the award, you’re going to have to keep in mind that this is a big deal – there are a lot of people that you beat out in order to be selected as the person to receive this award. All too often I see award recipients who try to use the occasion of their receiving an award as an opportunity to try to be funny or to amuse the audience. This is probably not the right time to do this. Treat the reception of the award as what it is – a big honor. This means that your words are going to have to convey how much this means to you. The first thing that you’re going to need to keep in mind when you are accepting an award is that yes, you do deserve it. You may not be perfect, but at this moment you are the right person to be receiving this award. That means when you are accepting the award you must avoid deprecating yourself or your accomplishments too much. To do so insults the organization that’s giving you the award by saying that they may be giving it to the wrong person! When you take the stage to accept an award, you want to be ready to do so with class and style. This means that if you’re going to have and opportunity to give an acceptance speech, you need to know what to say. Instead of stumbling over your words, saying “Thanks” and sitting down, show the organization that is presenting you with the award more respect. The most powerful way to accept an award is to find a way to let your audience know how much receiving the award means to you. The best way to go about doing this is to tell them a story. Acceptance speeches are best when they are brief. This means that you’ll need to tell a short story. What kind of story to tell? In this situation, the best kind has to do with your relationship with the organization that is presenting you with the award. If you can tell a story that touches on how you came to be associated with the organization, how you know the person who nominated you, what you think about the organization, or even better what this award means to you, then you’ll have all of the material that you need to create a great acceptance speech. Awards are a wonderful thing and we’d all like to win more of them. However, even as speakers we need to work on doing a better job of receiving them. The problem that too many of us have is that we’re not set up to get complements – we prepare ourselves to deal with hostility and pushback, not complements. When we win an award, we need to realize that as we accept the award we have a responsibility to clearly express our gratitude for being selected. The best way to do this is to involve the audience in our acceptance by sharing stories that relate to the award with them. It’s not hard to do a good job of receiving an award – the audience really wants you to have the award. Learn to accept their praise and find ways to show them how much you appreciate their attention and you’ll be the best award receiver that they’ve ever seen. Question For You: When you accept an award, do you think that you should thank specific people by name? Group Meetings: Group Hug or Group Mug(ging)?